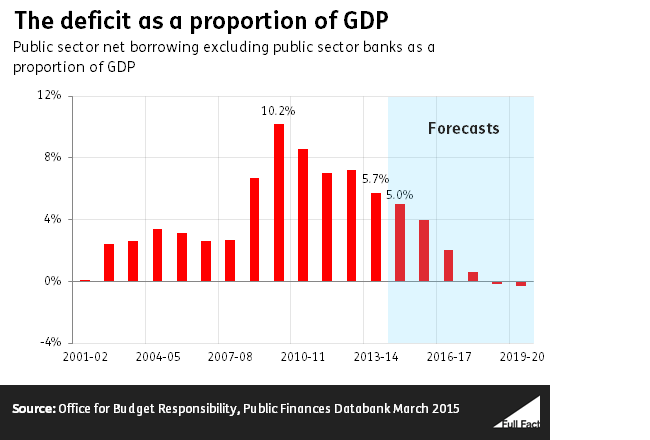 We've had 5 years of politicians talking about the deficit and the debt. 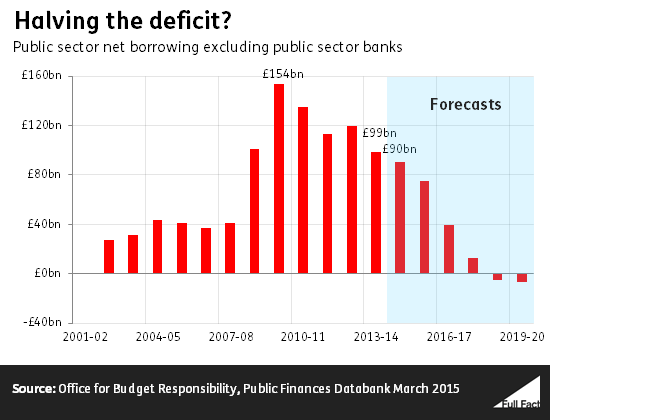 David Cameron said that the deficit has halved. This is true—if we're talking about the deficit as a proportion of GDP. But in cash terms, the deficit is only down by about two fifths. 2. 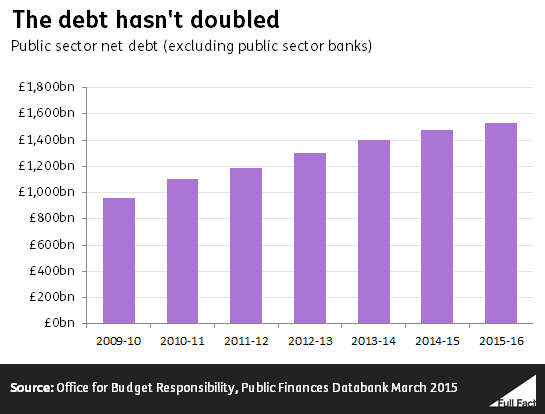 Nigel Farage said the debt has doubled. The debt has risen, but not quite that much. 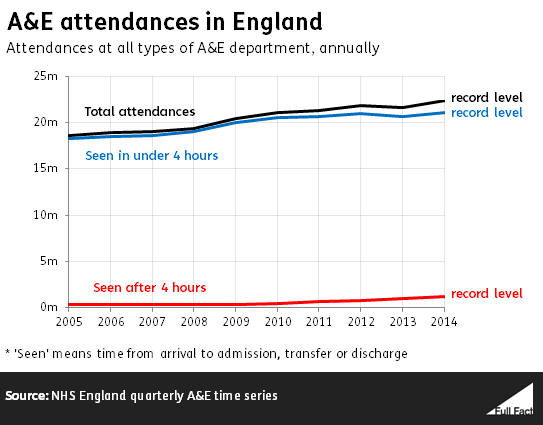 People waited more than four hours to be seen in A&E on 1.2 million occasions in 2014. That may not be 1.2 million separate people - it may well have happened to some poor souls on more than one occasion. Then again, waits of less than four hours were at a record high too. That's because there are record numbers going to A&E. People are waiting longer in A&E. The typical person waits about 2 hours and 15 minutes, compared to around 2 hours before the election. Teachers don't need no education anymore, the charge suggests. But "unqualified teachers" include some student teachers and teachers that are already qualified in another country — even Scotland. There are half a million full-time equivalent teachers in England. Those 17,100 unqualified teachers (down from 17,800 in Nov 2010) make up just 4% of that total. Numbers starting apprenticeships are up. 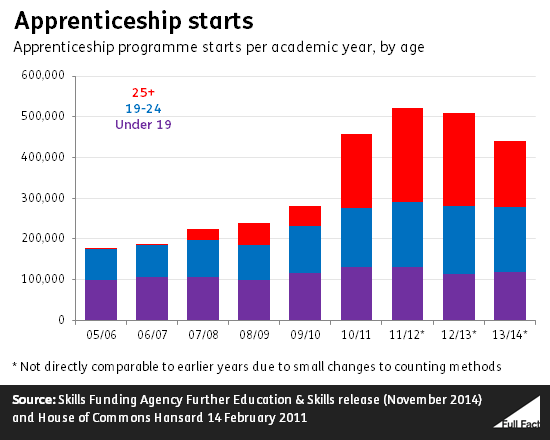 Those 1.9 million new apprentices represent better qualified youngsters, right? Not necessarily. The biggest increase was for those over 25, who made up 40% of new apprentices since 2010. Cameron did mention - rightly - that 1.9 million more people are in work since the election, but rounded it to 2 million through most of the debate. That's rounding up enough people to fill Wembley Stadium. If you're curious, 1.3 million of them are employees, and 600,000 of them are self-employed; 1.4 million are full time and 500,000 part time. There are 2.3 million more private sector employees, but 400,000 fewer public sector employees. It's not possible to say what proportion of these are on zero hours contracts, but the best numbers we have say that zero hours contract account for 2.3% of people in employment. It's true. Analysis of average hourly earnings, carried out by the Office for National Statistics in response to a Freedom of Information request, shows that roughly 20% of people were earning less than the living wage in 2013. In David Cameron's constituency, Witney, 16% of people were earning below the living wage. In Doncaster North, Ed Miliband's, the figure was 25%. The living wage is set by the independent Living Wage Foundation. In 2013, it was set as £7.65 an hour for the UK and £8.80 for London. This compared to the national minimum wage of £6.31. SNP leader Nicola Sturgeon said that Scottish people had paid more tax per person than the rest of the UK last year — and for the last 34 years too. This depends on how you treat North Sea Oil, and there isn't a single agreed way of doing this. When we measure the UK economy, we usually fudge this by saying that North Sea Oil isn't from any of the four countries. Divide the oil revenues by geography and Scotland generates more tax, but divide them by population and it's slightly less. More here. Last year the government spent about £10,300 per head in Scotland, and about £9,900 per head in Wales. The population of Wales is about 3.1 million people, so to bring spending per person in Wales to the level of Scotland would take about £1.1 billion. In the other regions, Northern Ireland gets a generous £11,000 per person, and England comes in last at just £8,700 per person. One house every seven minutes means about 75,000 houses a year. So is this what we need to house immigrants? Possibly, but there are many things about this that are uncertain. We wouldn't expect every immigrant to need a house each; some will live together. Best estimates suggest about 300,000 more immigrants come in than emigrants go out each year. If 75,000 homes is the 'need' then you're assuming four immigrants to a house. It also depends on other important assumptions, such as about how long immigrants stay for. We've been looking and we're still looking but we haven't yet seen any evidence to support such an exact figure. Immigration is also notoriously difficult to measure, and predicting how this will look in future years is even harder.